At the start of the Bumblebee Program in 1945 the aerodynamicists who were to design the new missile had little experience with supersonic flight. Some fundamental theories had been developed but most work had been on subsonic aircraft. Some test data were available for high speed projectiles, but there were no supersonic wind tunnels large enough to test missile designs. Initial flight control tests were conducted with a small subsonic rocket propelled Control Test Vehicle (CTV) in 1946. In 1947 a longer range two stage rocket powered Supersonic Test Vehicle (STV) was used to gain experience with supersonic flight control. The ramjet powered Experimental Prototype Missile (XPM) was developed in 1949. It was the first test vehicle to incorporate the ramjet propulsion, beamriding midcourse guidance and terminal homing features of the Talos missile. The XSAM-N-6 prototype Talos missile was flown from 1951 through 1954. The First Tactical Talos RIM-8A was introduced in 1955. The ramjet was boosted to operating speed by a large booster rocket. After the rocket was discarded the missile continued under its own power. This meant that the design must operate stably with two different aerodynamic configurations. The large wings were positioned near the missile's center of gravity where they were most effective for maneuvering the free flying missile. However, they were far ahead of the missile-booster combination center of gravity, therefore causing a destabilization of the combination during boost phase. This required the addition of very large stabilizing fins on the booster for the Experimental Prototype Missile. 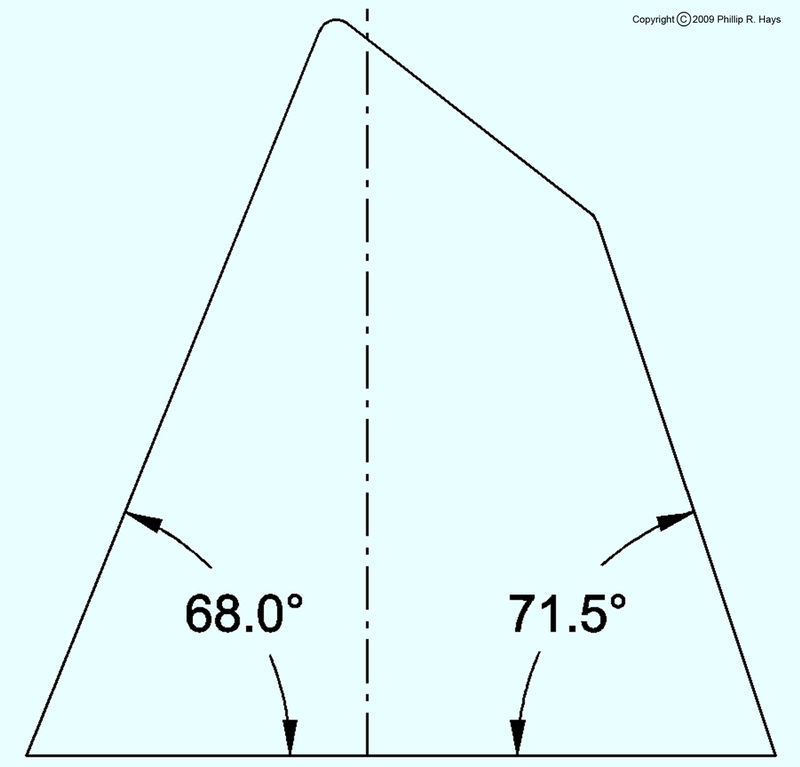 However, shipboard space was limited and large fins could not be used on a practical missile. 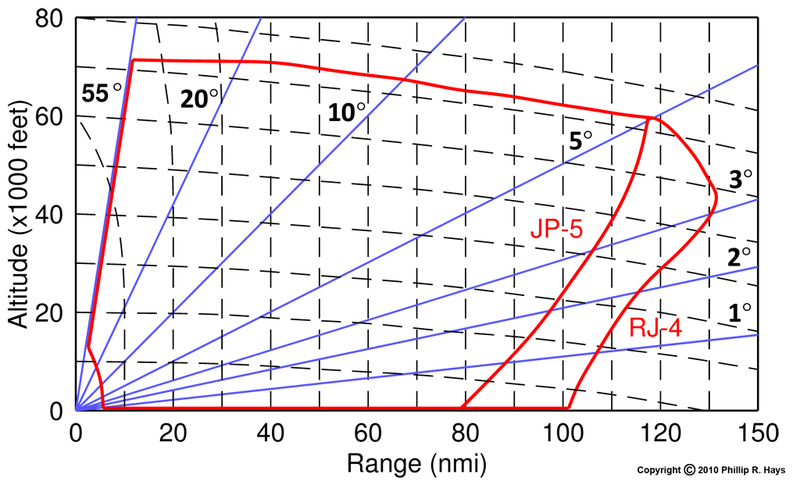 The graph shows the flight envelope for the Unified Talos RIM-8G missile burning JP-5 fuel and the RIM-8J with RJ-4 (dimer) fuel.3 The maximum launch angle was 55° and the maximum altitude was above 70,000 feet. The minimum intercept range was the distance for the booster to burn plus six seconds of flight time to acquire and home on the target, or about 8 to 10 miles. 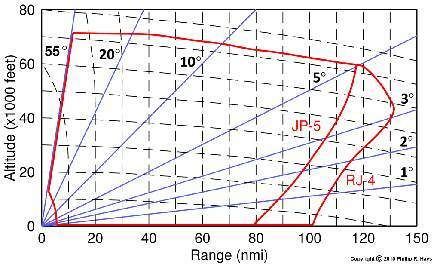 The maximum range at 70,000 feet was 118 nmi with JP-5 aviation gasoline and 123 nmi with RJ-4 dimer jet fuel. The dimer fuel improved range considerably at lower altitudes, with a maximum range of 130+ nmi at 56,000 feet. Range decreased at lower altitudes, partly because of increased air friction in the denser atmosphere. However, fuel flow was reduced at lower altitudes to maintain optimum engine performance and this also reduced speed somewhat. 1. Talos Aerodynamics, Lester L. Cronvitch, Johns Hopkins APL Technical Digest, Volume 3, Number 2, 1982, page138. 2. Talos Control System, Fletcher C. Paddison, Johns Hopkins APL Technical Digest, Volume 3, Number 2, 1982, page 154. 3. The Unified Talos, Frank A. Dean, Johns Hopkins APL Technical Digest Vol. 3, No. 2, 1982, page 123.